I adore Christmas. I love mince pies, Christmas carols, roast turkey, sprouts, nativity plays, pigs in blankets, Santa hats, twinkly lights in the High Street, candlelit church services and decorating the house from top to bottom. My favourite part of decorating is choosing and dressing the tree and since I like to make the most of the festive season we usually get our tree up early. This weekend marks the start of Advent in the Christian calendar and as a churchgoer I think that entitles me to put a tree up even though it isn't yet December. My husband is less sure but is very tolerant of my Christmas craziness. Now a dilemma. Real or fake? Research online convinced me that unless you plan to use the same artificial tree for more than 20 years, choosing a real tree seems to be kinder to the environment as long as it's bought from a company committed to sustainable tree farming and especially if the tree is recycled responsibly after Christmas. This is taking into account the materials used to make fake trees, the fact that they are not generally decomposable and are often transported across the globe. Ok so you've chosen to buy a real tree. But you only own a pedal bike. Or a tiny car. Or are just too flipping busy/frail/lazy to lug one home from the store. If that's the case - I have some great news. Have you heard of Pines and Needles? Basically it's a company selling, delivering and installing Christmas trees (and other festive stuff) which offers, I believe, the only money back guarantee on Christmas trees in the UK. I love the story of how the company started. Pines and Needles was founded by brothers Josh and Sam Lyle when they were aged just 15 and 13. They came up with the idea of filling an old horse box with Christmas trees from their family farm in the Scottish Highlands and, wearing traditional Scottish kilts, heading down to London to sell them. As the years passed (and the internet became a bigger and bigger source of shopping generally) the business grew and grew. Last year Pines and Needles sold over 50,000 Christmas trees across the UK. I loved choosing my tree from the clear lines of trees of all shapes and sizes with prices starting at £25. No peering at a squished or netted tree hoping it will be the perfect one for your home. I was impressed with the range, from windowsill-sized to "sing carols round it in the village square" sized! You can see my mum in the picture below admiring one of their bigger trees. She's demonstrating that she will never reach to put a fairy on the top of that! 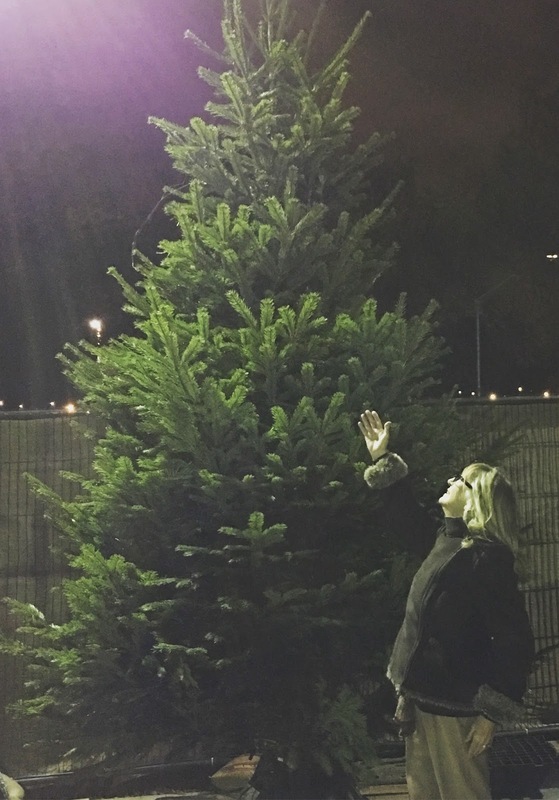 I wanted advice on what type of tree to choose and after a short discussion with the helpful and knowledgeable Tom at the Wimbledon Park branch I went for a "non-drop" Nordmann Fir which hangs onto its softer needles for longer than the spikier Norway Spruce. Tom also helped me pick out the tall slim tree I wanted for our new conservatory, then we added a base and cheery chaps in kilts netted my tree all ready for delivery and installation the next day. When the Pines and Needles van turned up mid morning the next day the children rushed out to see our tree. There was much excitement all round as it was ceremoniously carried round to the back of the house to be placed in the conservatory. It proved to be the perfect fit for the space I had envisaged as its home for the next few weeks. Hurrah! As instructed I added water to the base to make sure my tree stays fresh for the whole festive season. Josh Lyle told me if it stops sucking up water or looks a bit limp to scrape off a bit of bark from the bottom of the trunk to help it drink again. Top Tip! Then for the fun bit-decorating. 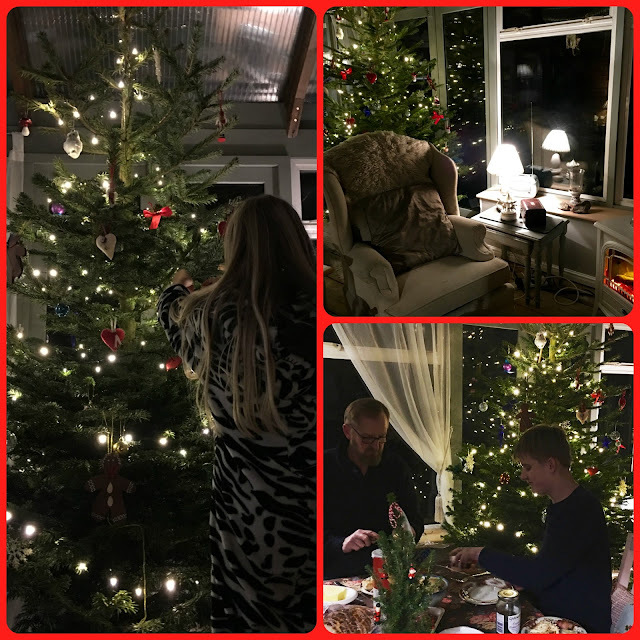 Pines and Needles sell decorations and lights for trees (as well as swags,wreaths, holly, mistletoe and other festive bits and pieces) and have a Christmas Theme inspiration section on their website offering advice on how to make your tree look awesome. In London and too busy to dress your tree or want a tree looking awesome for work or your organisation? Or maybe you fancy treating an elderly relative who might not be able to sort out their own tree? Pines and Needles will not only supply all the decs, they will even dress your tree for you. And when you want it gone, they will come back, take all the decs off and wrap them for next year and recycle the tree. On an environmental note I was impressed to learn that Pines and Needles claim to be carbon positive for most of the year and carbon neutral during the festive season. You can read more about how they achieve this and about how they do their best to help the planet on their website. Adding to their caring credentials is the fact that the company supports Action for Children, a charity which supports disadvantaged children across the UK. This year they hope to raise £15, 000 for the charity. You can find out how you can help here. 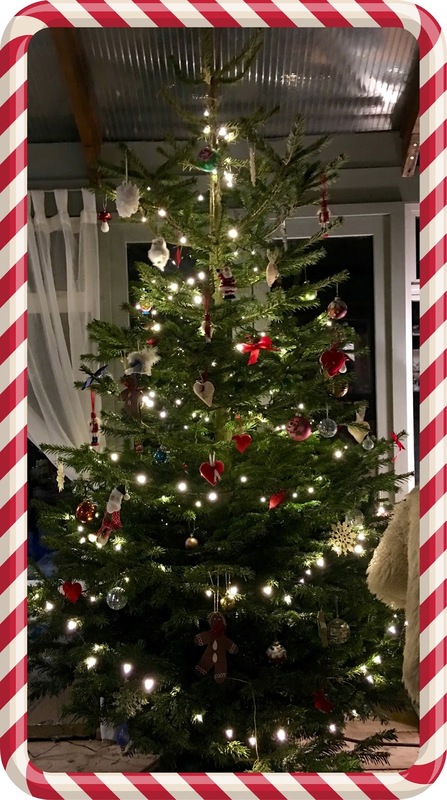 I have to say, I am very fussy about my Christmas trees and the one delivered by Pines and Needles is the most beautiful one I have ever had. It looks beautifully fresh and undamaged by transit - when the netting came off there were very few needles lost. I didn't have to turn the "bad" side to the back - the tree doesn't have a bad side. It smells gorgeous and I think it looks beautiful in my conservatory. I'm only disappointed that our house backs on to fields so it won't be spotted by many passers-by! Disclaimer: I was given a free tree, base and delivery by Pines and Needles for the purpose of this review. Views and opinions remain honest and my own. What a great idea! its always a dilemma getting it home. Im definitely getting a real one this year, I might even get two! You dressed it beautifully too.